When connecting the upper and lower unit together, pay special attention to the copper water pump tube (part #13) that sits between the upper and lower sections. You’ll notice there are 2 seals (part #12) – one seal for the top of the tube, and one seal for the bottom of the tube where it sits in the water passage housing. Make sure the water pump tube is aligned properly, and use Loctite sealing compound on the top seal. For the bottom seal, use a gasket sealing compound where it fits into the water passage housing. Where the copper water pump tube seats into the plastic guide (part #14), put a small amount of grease on the end of the tube. For the lower unit, the 3 o-rings (part #20) that fit onto the bearing housing – make sure to use gasket sealing compound on only the bottom o-ring. Also, unit, the gasket (part #19) that is under the water passage housing – make sure this gasket has sealing compound on this gasket. If not, it is advisable to remove the water passage housing and apply gasket compound onto this gasket. Start by locating the 2 drain screws in the lower unit (part #41A and #41B). Remove both screws. *Note, when re-inserting the drain screws, it is recommended to use new drain screw gaskets and apply some grease or gasket compound onto the gaskets. 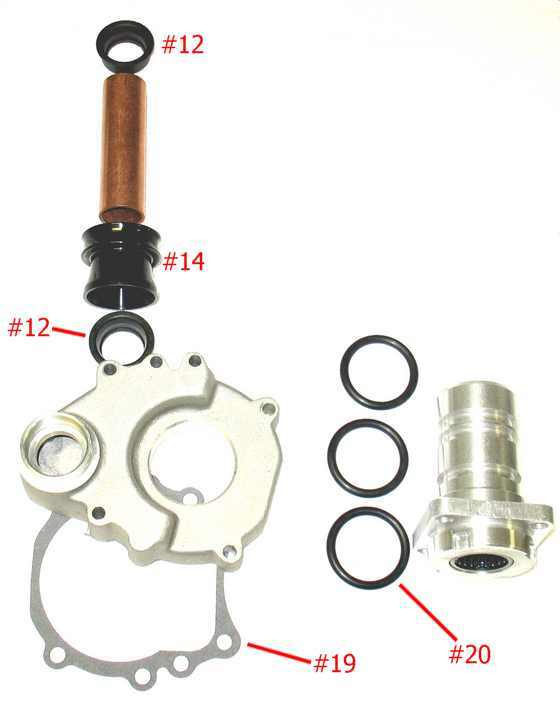 Insert one end your pump into the quart of lower unit oil, and then screw the other end where the fitting is into the very bottom drain screw hole near the fin (part #41B), and begin pumping oil into the unit until it just starts to come out of the upper drain screw (part #41A). When it just starts to come out of the upper drain screw (part #41A), remove the pump from the lower drain plug and re-insert the drain screw and new gasket. 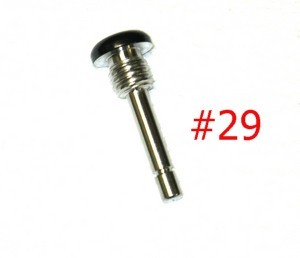 Use some grease or gasket compound on the drain screw gasket. Next, insert your pump into the upper drain screw hole (part #41A) and continue filling the outdrive with oil until it reaches the very top dipstick (part #51). 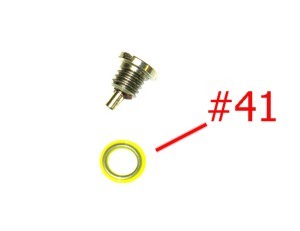 Re-insert the drain screw into the drain hole (part #41A) and apply some grease onto the screw’s gasket. *After running the sterndrive for 2 – 3 minutes at idle speed, allow 10 – 20 minutes for oil to settle, then re-check the oil level with the dipstick. Please note: Do NOT only use muffs and a water hose to test the outdrive for proper water circulation. The water hose has enough pressure to force water through the cooling system even if there is a problem at certain points in the path of cooling system. ONLY in-water testing described below can accurately tell you if water flow will be adequate for cooling. With the boat in the water, disconnect the hose from the thermostat housing. Testing should be done at idle speed, approximately 550 – 600 rpm. In 1 – 2 minutes, you should be able to fill a bucket with 2 gallons of water. The time to fill the bucket is based on engine size and recommended RPM. Please consult the OMC service manual for exact times based on your engine. Our primary concern is that there is a steady flow of water, no exhaust gasses pulsing and no exhaust gasses in the water. Note: Water pump pressure from the impeller is approximately 10 – 15lbs. An exhaust manifold leaking into the water port area can reach approximately 40-60lbs – this can easily overtake the water pump pressure and melt the impeller and impeller housing in the sterndrive. Manifold leaks are commonly caused by trapped or leftover water in the exhaust manifold over the winter in colder climates, or if it is not winterized properly. Corrosion of the manifold can sometimes cause leaks, mainly in salt water areas.